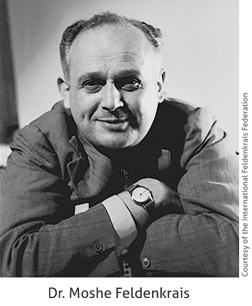 Before creating the Feldenkrais Method®, Moshe Feldenkrais was a distinguished physicist and mechanical engineer, who assisted Nobel Prize Laureate Frederic Joliot-Curie at the Curie Institute. He also became one of the first Europeans to receive a black belt in Judo, writing many books on Judo and training British paratroopers in self-defense techniques during World War II. After doctors could not help him heal from a crippling knee injury that he had sustained while playing soccer as a young man, Feldenkrais decided to heal himself. He was determined to find a way to walk without pain. Thanks to his wife, a pediatrician, he started observing how babies learn to move and how it is that they actually learn. His own recovery process led to the creation of the Feldenkrais Method® and its components: Awareness Through Movement® and Functional Integration®. The method incorporates his background in physics, Judo and his fascination with human development. Feldenkrais died in 1984, having personally trained a small group of practitioners, who continue to teach his method. Today there are over 6,000 Feldenkrais practitioners around the world. For more information and articles about Dr. Feldenkrais and the Feldenkrais Method® see Resources.